Between driving down Chestnut St in Waban this morning and then receiving this beautiful photo this morning in this week’s Upper Falls News, I’m beginning to think we’re in the midst of 2018’s Newton peak foliage. Does it get any better from here? Probably not. The wind and the rain we’ve gotten this week are accelerating the falling leaves, many of which didn’t get a chance to turn. But it’s still pretty good considering that the foliage in Maine, NH and Vermont peaked three weeks ago. I’m helping to organize a reunion for my Tufts fraternity during October of next year. Our fraternity closed its doors in 1967 so the brothers that remain are old geezers like myself. Those coming from outside New England always want to come in the first week of October because they insist that this is when the foliage is at its height. We who live here tell them it doesn’t usually peak until 2 to 3 weeks later. It’s finally dawned on me that those wanting the first week in October lived here when the foliage peaked at that early date. I think it is now 2 to 3 weeks later at least in part because of climate change since fall bird migrations are also occurring later. My observation: This is an unusual foliage season. 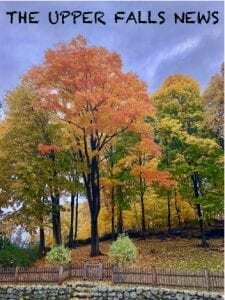 This year the stars of the show are not the usual suspects, red maples and sugar maples, but their invasive cousins, the Norway maples. They usually turn dull brownish-yellow, but this year they turned very intense bright yellow, some even orange. Very pretty. Oaks are very colorful this year too.